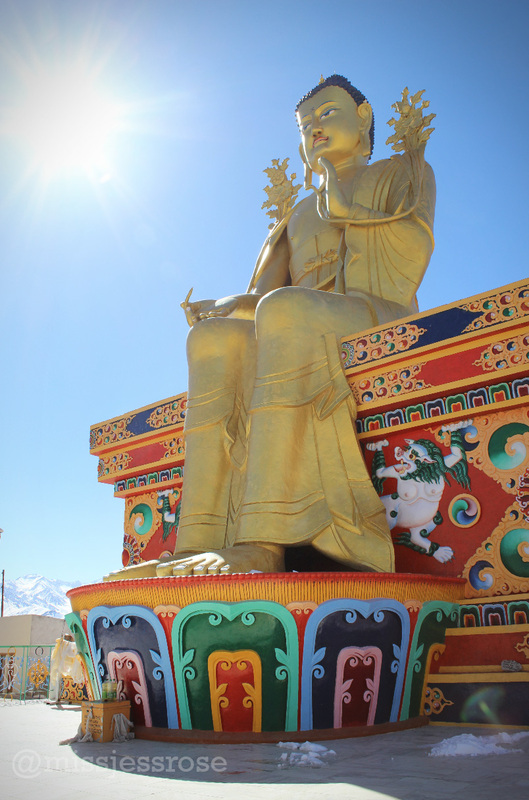 Ancient Tibetan Buddhist Monasteries are a wonder to behold in real life, and as I wrote last week, there are a number of them in Ladakh, India. 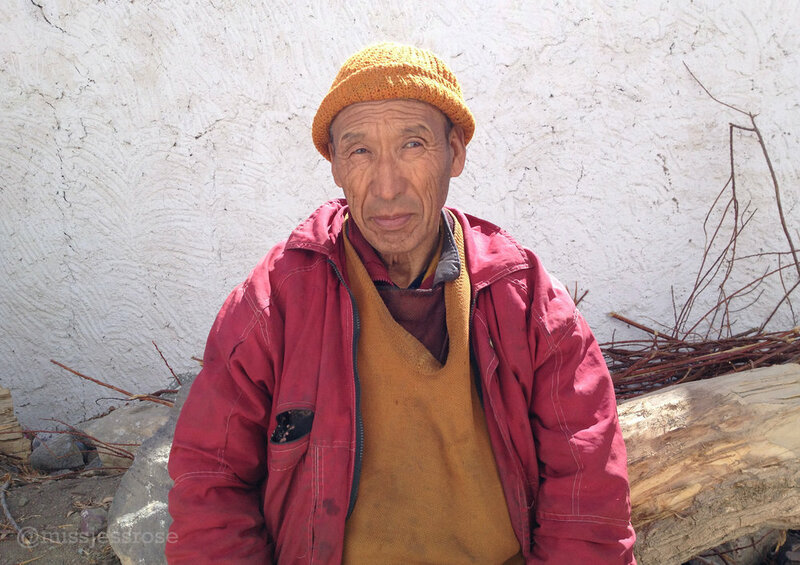 The region is a Tibetan Buddhist enclave due to it’s proximity to China and Tibet. 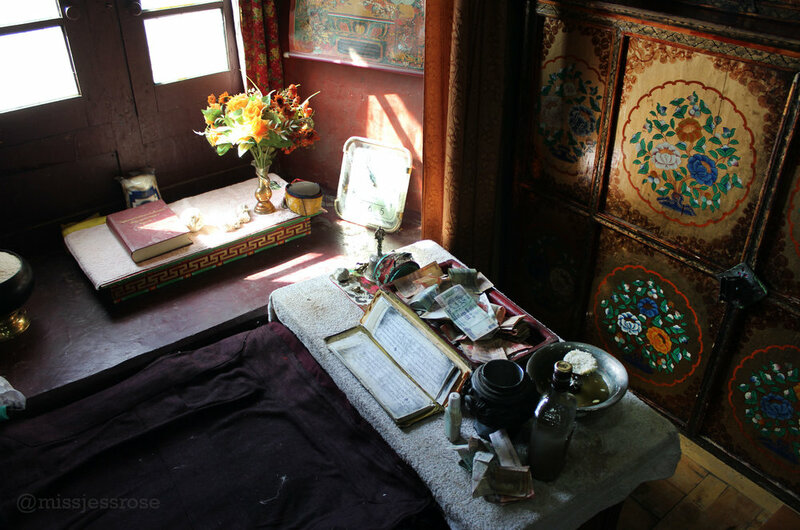 For centuries, monks have been peacefully maintaining many of these beautiful, spiritual treasures. Today, we visit three additional monasteries: Alchi, Likir, and Spituk. 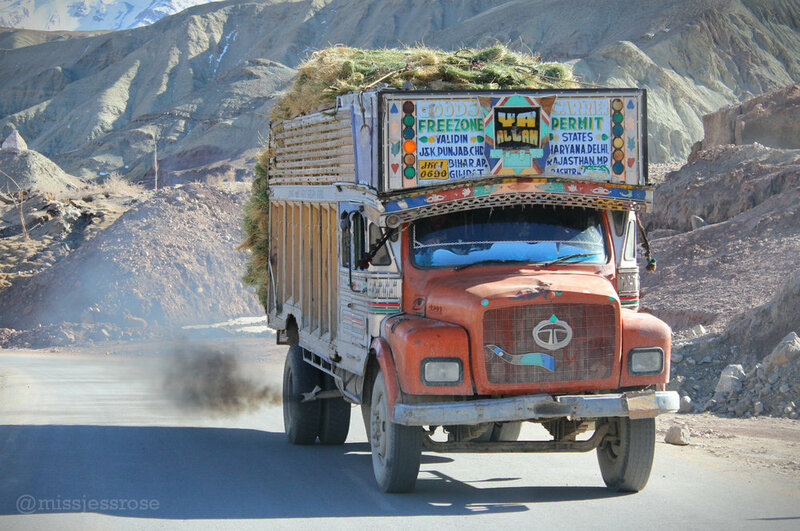 Once again, we hire a taxi and drive north through the desolate, high-altitude landscape beneath a relentless sun. It feels like Mars, rocky and barren without trees or roots to hold everything together, just mountains for miles. I see a fuzzy scrapper dog standing in the middle of the road. I can’t help but wonder, how does he survive in the middle of nowhere? Alchi is perhaps one of the oldest monasteries we visit, first built in 958. 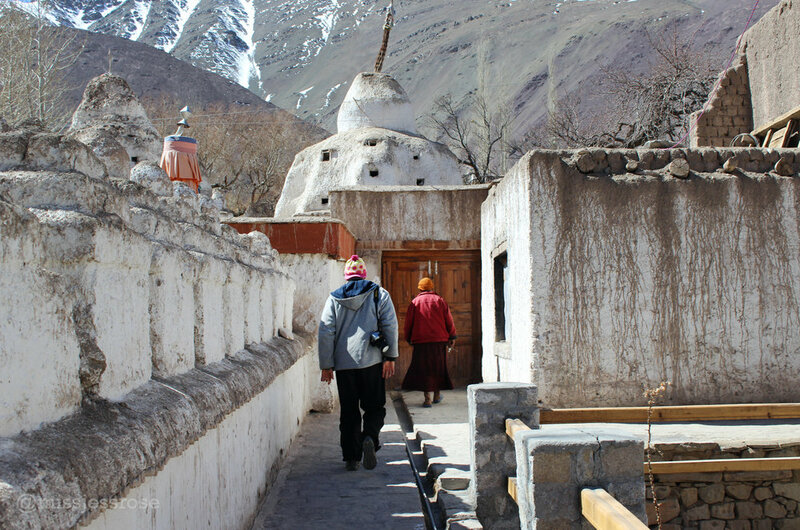 Although there are multiple buildings of various ages on the grounds, some of the oldest paintings in Ladakh are said to be housed here. Per usual, we are the only tourists visiting Alchi today—one of the benefits of visiting Ladakh in wintertime. 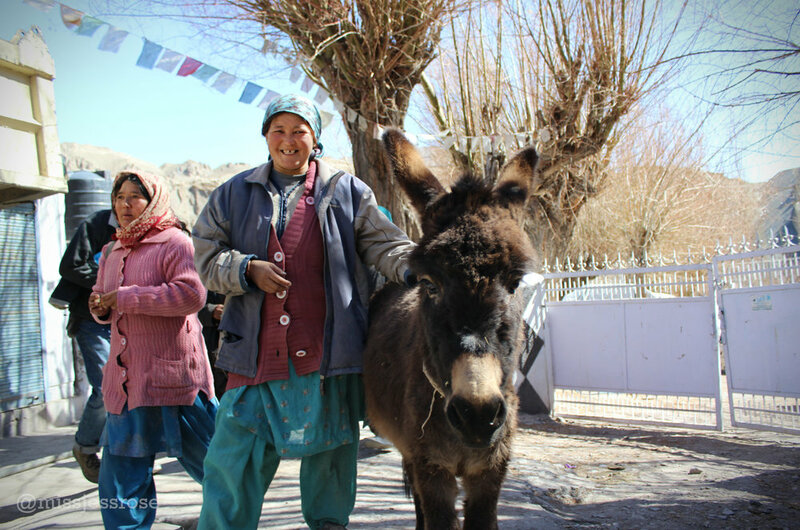 Along the pathway down to the monastery which parallels the crystal clear blue river, we meet several wrinkled elderly women with wooden harnesses strapped to their backs hauling huge rocks meant to be used for constructing a wall a few blocks away. It's shocking to see women as old as my grandma doing hard, manual labor. In the US, they’d be stuck in nursing homes, not hauling huge rocks. Prayer flags line the walkway towards the monastery, and the Indus River flows just below. I spin all the golden prayer wheels on my way inside. Once we arrive at the entrance, we wait around for a monk to emerge, as has been the habit at every other monastery we’ve visited. It takes awhile, but finally an impossibly wrinkled red robed monk shows up and begins the process of walking us through and unlocking the buildings on the complex, room by room. Alchi is magnificent. Indeed, there are numerous historical murals, some heartbreakingly in disrepair. Portions of the frescoed walls are uneven and cracking, no doubt from surviving hundreds of years of earthquakes. Others are splattered with water damage. I have the thought that someone should fundraise to repair such historical beauties. Mini Buddha after mini Buddha mural, I feel like I’ve just walked into an art history book. I wish I could spend hours examining the tiny brush strokes, observing the differences and understanding the hand that painted all this wonder. 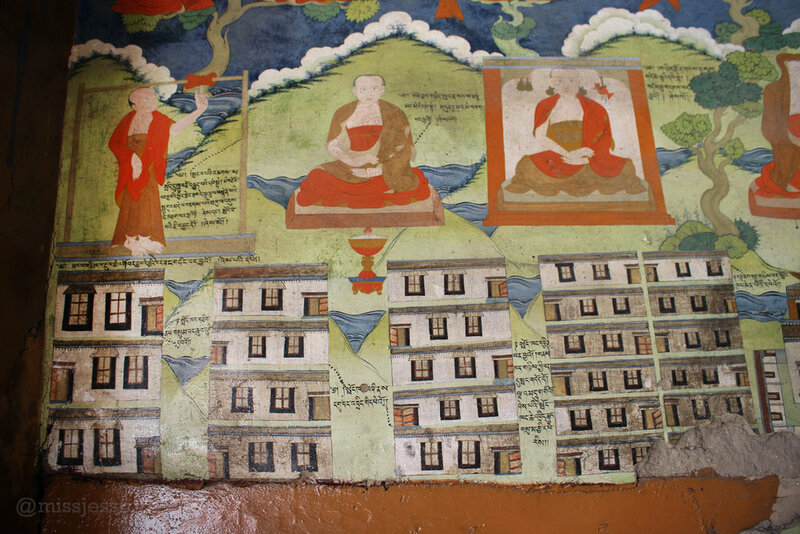 I also wish I had interior photos to share, but respecting the integrity of the monastery, photography inside was prohibited (in order to preserve the paint). The final room is definitely the gem of Alchi. A breathtaking three story tall room covered in the most lovely paintings. Inside, each floor level is like a cake, with different painted patterns not only on the walls, but also on the ceiling. I love the ceiling. I want it in my house. The pattern is like patchwork, portions of color segmented together. One a circular pattern, another a lotus pattern, it goes on and on, like wallpaper, but so very old. Large Buddhas sit lower on the wall panels, and the epic ceiling patterns creep downwards weaving onto portions of their legs. The approach to Likir is impressive. From a distance we can see a giant golden Buddha sitting cross-legged outside. The monastery is surrounded by by snowcapped peaks, and overlooks the valley with the river far below. Inside, again it takes a long while before a monk emerges. In fact, we pretty much resign to the fact that we won't be able to get inside. This monk is on his cell phone, claims he was at lunch and busy. 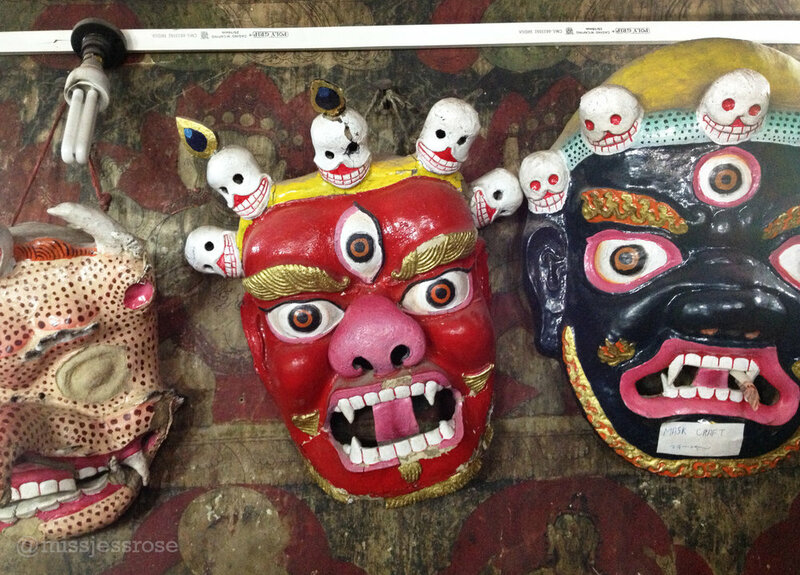 Finally he unlocks a few rooms and shows us a museum with Tibetan artifacts. But this place was not so much about the interiors, more about the strategic location and exterior view. The valley below is impressive. We climb up onto a flat roof and check out the sprawl below us, more flat roofed homes stair stepping the tiered mountainside. We take one last look, and head out to the next location. Along the way, I'm reminding of how military the landscape is here. We are pass encampments, barracks, trucks on the road. Even a whole platoon of soldiers in green uniform with white boots. Sometimes our taxi driver lifts his hands in prayer to his forehead with respect when we pass by holy sites. 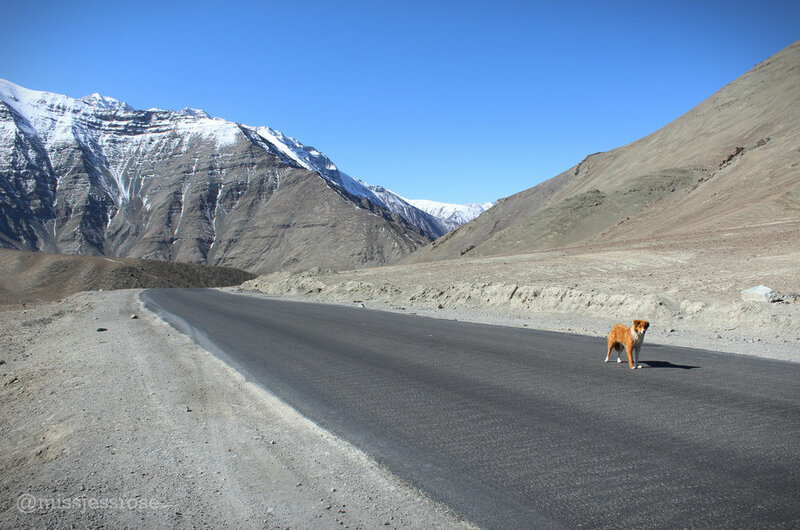 He does this as we arrive at Spituk, a monastery in Leh, which sits upon yet another tall rocky outcropping right next to the single airport runway. Prayer flags flutter relentlessly, and the vista of Leh below is beautiful. In the main courtyard, monks seem to be sorting through an inventory of holy items, perhaps preparing for a yard sale? I imagine all the colorful wonders I would bring home if I could carry everything in my small pack. And with that, our tour of the many historic monasteries in Ladakh comes to an end. 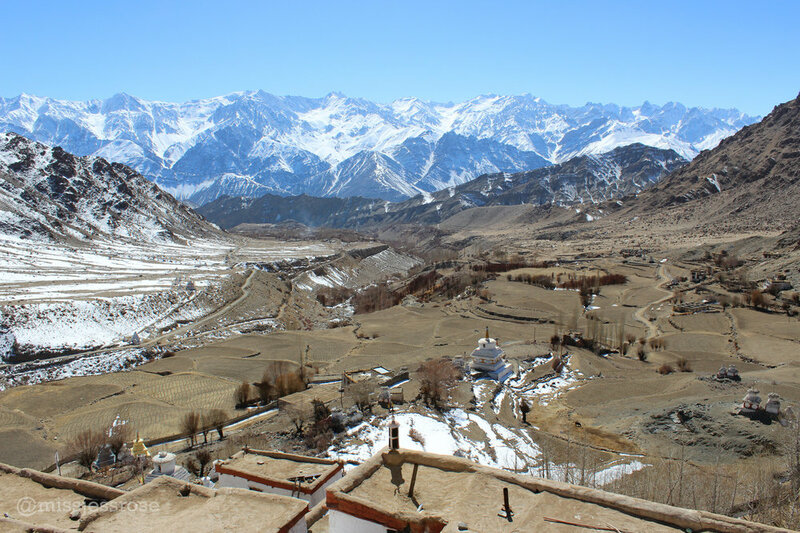 I recommend hiring a taxi driver to transport you to these remote Tibetan Buddhist monasteries in the area surrounding Leh, Ladakh. Depending on how many you'd like to see, you should split up your travels in a similar format to my own. In one day, you can see Alchi, Likir, and Spituk as they are in the same direction (north west). On a second day you can hit up Hemis, Stakna, and Thiksey, which are in the opposite direction (south east). If you plan to attend a special holy day festival such as the oracles at Matho monastery, be sure to research the date in advance.